This book by Charles J. Sykes first come to my attention from a list of rules that was circulating on the internet but was attributed to Bill Gates. #1 Life is not fair. Get used to it. #7 If you think your teacher is tough, wait until you get a boss. He doesn’t have tenure, so he tends to be a bit edgier. #9 Your school may have done away with winners and losers. Life hasn’t. #29 Learn to deal with hypocrisy. #32 Television is not real life. #38 Look people in the eye when you meet them. #43 Don’t let the success of others depress you. #48 Tell yourself the story of your life. Have a point. 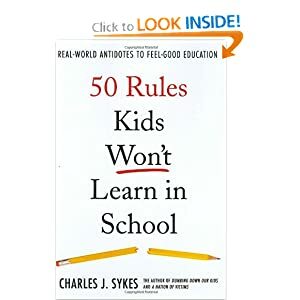 Charles J. Sykes is the author of five previous books: A Nation of Victims, Dumbing Down Our Kids, Profscam, The End of Privacy, and The Hollow Men. His columns have appeared in numerous newspapers, including The New York Times and The Wall Street Journal. A radio and television host at WTMJ in Milwaukee, Wisconsin, and a senior fellow at the Wisconsin Policy Research. This book orginates from his list of 14 rules first broadcast on his Milwaukee, Wis., radio talk show.